I’ve been doing The Project 333 a full year now. 1. I’m happier with my body. I don’t have a perfect body. Who does? But by not feeling like I have to religiously follow and fit into fashion, I’m instead choosing what works for me, with the body I have, right here and now. This has led to greater acceptance of who and what I am. I feel free. 2. I know what I need. “Gaps” in my wardrobe become immediately obvious. When I started out, I couldn’t figure out why I wasn’t wearing my lovely vintage shirts. Turned out, it was because I had no jeans that comfortably fit (duh!). But because I had so many clothes, I couldn’t figure this out. 3. I wear everything. There’s no wastage. Everything that is in my wardrobe and drawers fits me, looks good, is comfortable, and gets worn. 5. I’ve developed my own sense of style, and I don’t follow fashion so much any more. I don’t feel the need to have “must have” items when I know they won’t suit me. For example, horizontal stripe tops are “in”. But I know they won’t suit me, so I won’t be buying. I still look current, I’m just not “trendy”. 6. Having a smaller wardrobe has taught me what I like and what I think looks good. I’ve learned, for example, that I don’t wear scarves, jewelry and accessories. I like to keep things simple. I also like real leather handbags, belts and shoes – fake doesn’t do it for me. The backbone of my wardrobe is lovely vintage shirts and dresses, supported by leather jackets, boots and bags, denim jeans and leggings. 7. I spend less, and spend more wisely. I’ve learned where to spend money and where to buy cheap. Dresses I buy cheap. T-shirts I buy cheap. Leggings I buy cheap. Shoes, jackets and belts I spend and buy quality. Overall I am spending a lot less on clothing, and my clothes are getting greater wear. 8. I’m less stressed. I don’t worry about having anything to wear, because everything in my wardrobe fits me and is wearable. Despite having fewer items, I have more to wear than I ever did before. I know I can pull anything out of my wardrobe, and it will feel great and look good. 9. Space! I have space in my wardrobe and drawers, and can see everything I own. This is so refreshing. If you haven’t tried The Project 333, it’s worth having a go. I’d never have thought that little ole shopaholic me would have settled in to having a capsule wardrobe, but now I can’t imagine things any other way. 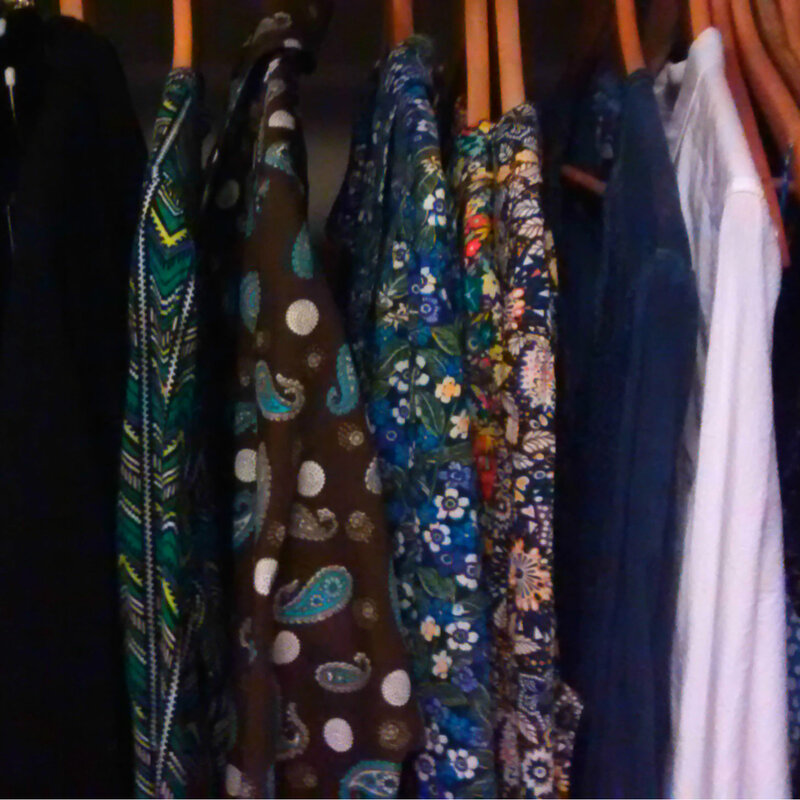 My capsule wardrobe, whose backbone is a range of vintage shirts, which I support with basic black and brown. Having less works so well for me. This is how I feel too. In fact, I had a post scheduled for Monday on why I don’t keep many clothes 🙂 It’s nice to look in your closet and only see the stuff that you actually wear. It really is. Before I started this project, I had so many clothes in my wardrobe I could hardly squeeze the hangers out when I needed something! These days I have more hangers than I need – I gave about 20 away, and still have too many! What PERFECT takeaways! IT was a breath of fresh air to read this. I’m so happy for you and all you have learned and accomplished. Congratulations and keep going! This is brilliant! I love point 2, 3 and 4. Something I’ve learned with having a capsule wardrobe without even realising. Thanks for your post!